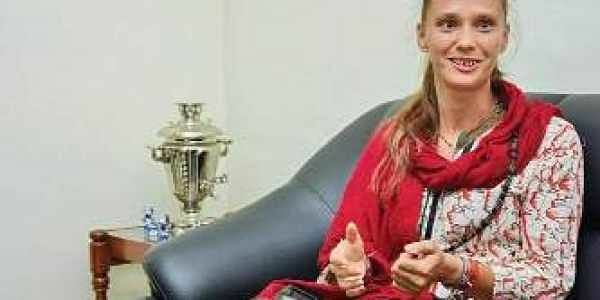 THIRUVANANTHAPURAM: Settled comfortably on the sofa, Alyona Beketova chants a few lines from the Kanakadhara Stotram, composed by Shankaracharya.“My pronunciation is not perfect,’’ she adds sheepishly. Enamoured by India and the Indian culture, Beketova has come to Thiruvananthapuram all the way from Crimea, the region on the Black Sea coast that has witnessed intense political turmoil in recent years. And she was hooked. This is her third visit to India, and this time she managed to spend several weeks in Puttaparti taking courses in the Vedas and Upanishads. Alyona is now staying at Varkala. Bharatanatyam brought her closer to Sanskrit, but she had a hard time locating teachers in Crimea. Sanskrit, she says is an interesting language with an interesting grammatical structure as far as a Russian is concerned. There are many similarities between the grammars of the two languages, she says. ‘’Sanskrit grammar is hard, but some words share same roots with Russian. Sanskrit grammar is very interesting in that some grammatical forms strongly resemble old Russian forms,’’ says Alyona.